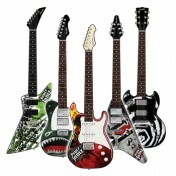 As the name suggests this range of guitars are very thin, but inside have loads of technology that’ll make you think you’re a mini rock god. Play freestyle or accompany one of the many tunes built inside, all you have to practice are your dance moves. 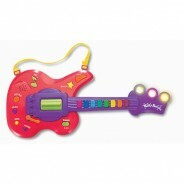 For younger wannabe pop stars this is the perfect way to begin your strumming career. The Rock and Learn features an 8 key keyboard and 4 song cards and 4 play modes that include record and play your music, normal play mode, demo mode and an easy play mode. Batteries included too so you can get started straightaway. It’s almost six feet long and has a built-in speaker, roll it out on the floor and get ready for fun. 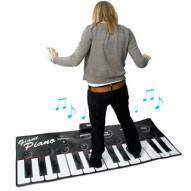 Start stepping on the 24 touch sensitive keys creating your own tune or play along to one of the ten built-in tunes. As well as piano, this keyboard features seven other instrument tones saxophone, violin, accordion, trumpet, harp, xylophone and guitar. After some practice you can also record your efforts. 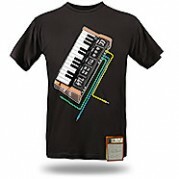 Amaze your freinds as you put on this almost magical Tee, that image on the front is a fully playable 80’s style keyboard and has eight different sound that play when you press them. Complete with a mini speaker box that you can hide at the back or display proudly at the front, be warned of people coming up and proding you though. 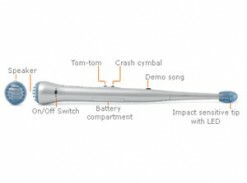 This pair of drumsticks lets you bang along to your favourte music, unblike using penbcils though these actually produce a realistic snare drum sound. Bash them against a surface or in mid-air, fantastic fun.